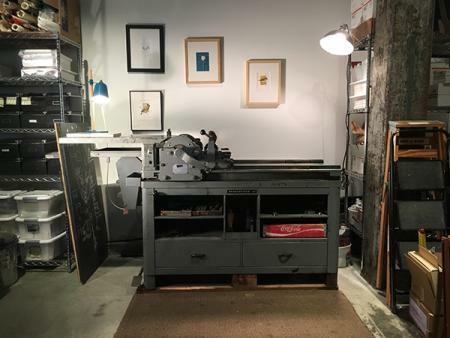 I have two letterpresses to sell, details below. Please be in touch with any questions. Everything is currently in my studio on Bergen Street in Brooklyn, NY. A bit below ground floor, but there is a freight elevator and the Vandercook is mounted on a pallet so it can be easily moved with a forklift. I have movers I’d recommend! - It’s in great shape and I’ve used it for tons of wedding invitation and greeting card work over the last several years. - Related materials are included: all the wash-up parts that are not currently attached, lockup bar, quoins and keys, 9” x 12” standard relief Boxcar base, and more. - The press is mounted on a pallet, so it’s a breeze to move with a forklift. - This press is in good working order, and has a beautiful custom- built mission-style stand (made by my dad, Craig Campbell) on locking casters, with 2 pieces of removable marble ballast on the base - the marble area makes a great bookshelf for heavy oversized books! - The press is mounted to the stand with 4 easily removable bolts and the whole unit can be moved by someone who has decent upper body strength - the press is about 100 or 125 pounds and has handles for carrying so that one person can move it. It takes two people to move the base if you’re doing stairs - it’s maybe 75? - The press is in ready-to-print condition and has rollers in good shape, as well. - Includes: 6” x 9” chase, 4.5” x 7.5” Boxcar deep relief base, 2 or 3 quoins and keys, trucks, rubber rollers (with custom protective storage box), composing stick, and a few other small pieces.